On the banks of the Seine, Parisians expressed a sense of disbelief that their cathedral, which embodies so much of French identity, history and culture, was left in such a state. PARIS — In the most solemn week on the Christian calendar, Paris is in mourning. 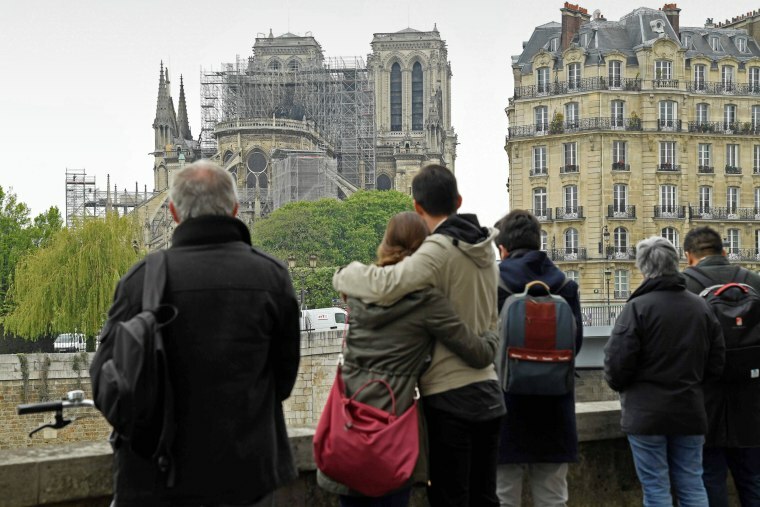 “People have come as if they are visiting a sick friend,” student Jossien Prouteau, 22, said while standing on a bridge across the Seine River, which connects the Left Bank with Île de la Cité — the island where Notre Dame is. "Watching the flames last night was like watching a woman being beaten up without being able to do anything." “I’m in mourning," he added. "It is not only a beautiful work of art aesthetically, but there is a spiritual connection." Others on the banks of the Seine expressed a common sense of disbelief that Notre Dame, which embodies so much of French identity, history and culture, could be left in such a state. “It’s been something we’ve always seen. We passed by it without paying attention, but today we’re measuring up how much this building means to us,” said Pierre Ribette, who had come to take photos of the ruins to send to his children, who live abroad. A sea of smartphones were pointed toward Notre Dame's damaged roof in the nearby Saint-Michel area. “I’ve never seen so many people here. I had trouble making it here from the Metro,” said Georges Montero, 65, who owns one of the riverside stalls selling traditional postcards and prints of Paris. Chet Wargocki, 67, who recently moved to Paris from New York, was more optimistic. “The great lady is clearly distressed, but she is still magnificent and indomitable,” he said while surveying the cathedral from the terrace of a local brasserie. Jack Lang, who served as France's culture minister between 1981 and 1986 and then again between 1988 and 1992, was among those who gathered on the banks of the Seine to survey the damage. He said predictions that it would take "tens of years" to rebuild the cathedral were "unacceptable." “This is a monument that is dear to the heart of millions of people around the world,” Lang said. "It needs urgency." Hours earlier, crowds gathered after dark to sing the "Hail Mary" as fire swept across the roof and threatened to raze the greatest of Gothic cathedrals to the ground. Nearly 400 firefighters battled the blaze. Human chains were formed to rescue relics and priceless works of art, including a crown of thorns some believe to have been worn by Jesus Christ. It remained unclear Tuesday how the fire had started but authorities said the incident was being treated as an accident. It wasn’t until late at night that a city official said the structure of the building — including its two famous bell towers — had been saved. Crews had been battling the blaze for around nine hours. French President Emmanuel Macron pledged that France would rebuild the 850-year-old cathedral, considered to be one of the most important Christian places of worship in the world. The popular tourist attraction welcomes some 14 million visitors each year and was undergoing renovations. "There does seem to be a death in the family, not just the Catholic family — the world family," Cardinal Timothy Dolan, the archbishop of New York, told NBC's "Today" show on Tuesday. "As people gather around and look at the charred remains of our Notre Dame, it's almost like we are at a funeral parlor." Some around the Île de la Cité were under no illusions about how long it would take to return Notre Dame to its former glory. “It’s such a symbol for everyone living in France, everyone in Paris,” said Jane Winfield, 58, who moved to Paris from Britain around two decades ago. “I regret that I may not live long enough now to see it fully restored."